Do you need to find a new purpose for your job? Would you like to make your work as a manager more rewarding? Use these tips to rethink your role. 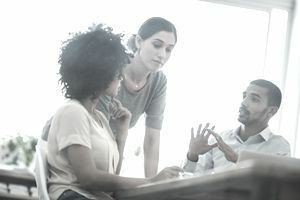 Helping everyone on the team understand how their role connects to the group and organizational objectives. Translating senior management's strategic objectives into programs and approaches that bring them to life. Exposing colleagues to new ideas and approaches for strengthening performance at the individual and group level. Helping the team navigate challenging issues and ethical dilemmas when choices are not clear, and the decisions come with implications. Scouting for individuals who display the potential to succeed and grow in the firm's working environment and culture. Helping individuals recognize their strengths and designing opportunities for them to develop further and leverage those skills and abilities. Providing clear, timely feedback and coaching guidance on resolving or eliminating behaviors that detract from top performance. Mentoring individuals as they consider their longer-range career paths and plans. How people perceive they are treated. Are they valued as individuals and treated with respect and fairness? Whether people are free from fear in their jobs. Are they comfortable suggesting new ideas or experimenting with new approaches? Do team members recognize the need to be accountable for their contributions and commitments? Do they have confidence their manager will support and when needed, defend them? Forming and framing a positive working environment based on shared values for respect, trust and accountability is a critical part of the manager's role in today's world. An early mentor of mine regularly referenced the phrase, "Remember, it's all about the journey," when listening to my latest frustrations and challenges. I recall not completely understanding the meaning of her words. I was looking for help in the middle of a workplace tornado, and here this individual was sharing philosophy. Years from now as you reflect on your career experience you will remember the people and teamwork and camaraderie and the experience of working together. What you will not remember or care about are the quarterly numbers, the budgets or the headaches. The journey of working and sharing and learning together will reign supreme in your memory. The challenge for many of us is how to keep that in context in the here-and-now and find purpose in our daily job activities as a manager. Taking a chance on someone or showing support for them after a failure can have long-lasting ripple effects in the lives of our coworkers. The manager who believed in my abilities as a young professional, to do a job at a much higher level in spite of my lack of experience gave me the gift of self-confidence. An individual I had no choice but to terminate looped back a decade later and offered that the respect I showed him in the process forced him to reevaluate where he had gone wrong. It was during that difficult situation that he decided to turn his career and life around. Often, work feels like a never-ending rush to put out fires and resolve crises. Nonetheless, good teams led by active managers learn to strengthen their performance, improve their quality, innovate to try new things and slowly, day by day, reinvent themselves. One manager used the new fiscal year kick-off not to talk so much about goals looking forward, but to ask the team to look backward at the prior year and identify all of those things that worked and that they wanted to do more of in this upcoming period. The goals seemed easy to digest when considered through the filter of so many positive achievements and behaviors. Walking in the door in the morning with the recognition that the most important work you can do all day is to offer coaching support through the delivery of constructive and positive feedback sets the tone for a positive day. Good people want feedback. They appreciate help in developing their strengths and overcoming or bypassing their weaknesses. And your work to help people develop through a series of unique and challenging experiences is a form of showing high respect for your coworkers. Remember, today's team members are tomorrow's senior managers, executives, and even CEOs. Your coaching can make a difference in the trajectory of their careers and lives. A positive working environment is the outcome of the nearly endless interactions we have as managers every single day. Every encounter and every meeting is an opportunity to show individuals and the larger team that the values of respect, trust and accountability are real and meaningful. Navigating and learning from the struggles is a part of the journey. You will have bad days—we all do. The great news is that you get a do-over tomorrow. And problems that seem challenging one day are always just a bit easier to solve after a night's sleep. The life of a manager is much about numbers and productivity and deadlines and dealing with challenging people issues. The daily work and stressors are always present. However, by focusing on the opportunities you have to support and develop others while building an environment that draws out the best in your coworkers, you develop an appreciation for your real purpose as a manager. Long after you forget the numbers and results, you will remember the people who impacted you and the people you were able to have an impact along the way positively. Remember to enjoy the journey!